Beauty, elegance, and love all come to mind when you lay your eyes upon this stunning 14K white gold diamond cross ring for women from Apples of Gold Jewelry. The absolutely stunning seventeen diamonds that are found throughout the cross on the top of the ring total 1/10 carat of diamonds (0.10 carat), and are rated G-H for color and I1 for clarity. The diamond ring graduates from 2.3mm at shoulder to 1.8mm at base. The beautiful 14K white gold and diamond combination is always a favorite! "Psalms 23:1-6 - (A Psalm of David.) The LORD [is] my shepherd; I shall not want." 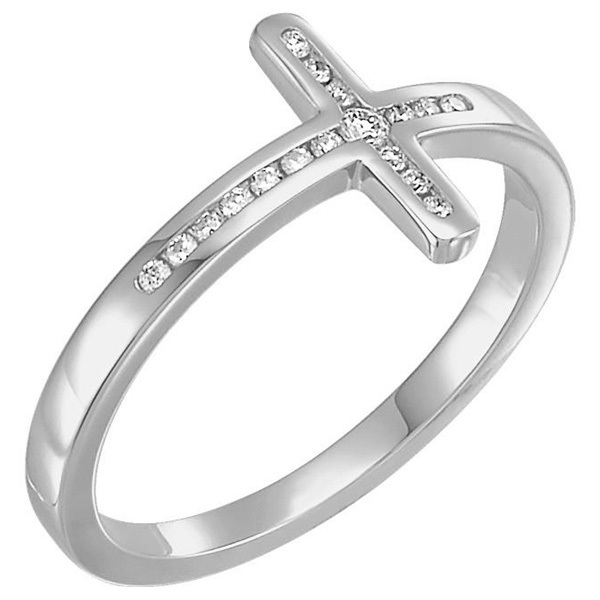 We guarantee our 14K White Gold Diamond Cross Ring for Women to be high quality, authentic jewelry, as described above.